Our inn’s unique venue offers that “something different” you’ve been seeking for your Kansas City area wedding. At Hawthorn B&B, the list of affordable options for your wedding are endless. Our goal is to make your day as stress free as possible. We offer Complete Wedding Packages or you may elect an a la carte approach and rent the mansion and/or estate only. When you choose Hawthorn B&B for your Missouri wedding and/or reception, you will choose the services and accessories you would like us to provide and those that you choose to arrange yourself. We are available to provide complete event planning services. No two couples or weddings are alike. We encourage our brides (couples) to exercise their preferences and build their special day around their own uniqueness. Check out our beautiful wedding photos in our photo gallery. Tables & chairs are included with your rental fee based on the number of expected guests.By adding guestrooms (we have six) you can turn Hawthorn B&B into your wedding headquarters for the weekend. We can accommodate up to 15 guests in beautifully decorated, extra large guestrooms. All guestrooms have private baths, individual heating and air-conditioning, cable TV, Wi-Fi and come with a hearty full home-cooked breakfast each morning. Hawthorn B&B can accommodate up to 40 guests inside the mansion for a sit-down, served meal or as many as 70 if you envision a casual social, mingling type of reception. The front veranda is the perfect atmosphere for that group that is little too large for inside only but you don’t really want a full “lawn party” reception. The front lawn of the estate can accommodate larger outdoor weddings in excess of 200 guests with or without a tent. You can choose from several outdoor locations to experience your dream of a “garden wedding” or exchange your vows of commitment on the front steps surrounded by the majesty of the mansion. Catering – we’d be happy to provide your catering needs ~ or outside licensed caterers are welcome. There is a modest fee for the use of the kitchen and some restrictions do apply. Although alcohol cannot be sold on the property, it can be served. This option offers you the ability to provide whatever you would like for your guests, without a minimum charge for alcohol ~ champagne, wine, beer, spirits, sparkling juice etc. We will gladly chill and serve the beverages you provide. Most couples find this to have a significant positive impact on their budget. Red wine is prohibited inside the mansion. For liability reasons, we do require that we rent all tents that are erected on the property. Based on the number of guests expected, we will recommend the best size for your reception. Additionally, we can offer suggestions regarding types of tents, sidewalls and dance floors. Add all six of our elegant guestrooms for $930.00 per night, all overnight guests receive a full home-cooked breakfast in the morning. 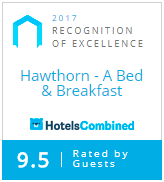 Ask us how you can make Hawthorn B&B your wedding headquarters for the weekend (or any two consecutive days you want). Private access to the mansion from 4pm on Friday until 11am on Sunday. Rent the entire estate including all six of our elegantly appointed guestrooms with a full home-cooked breakfast each morning and turn Hawthorn B&B into your magical wedding venue. Contact Innkeeper for details, some restrictions apply. Pricing starts as low as $3495.00. Outside licensed caterers are welcome. Some restrictions apply.